PRATICIMA is a group formed of three medical equipment leaders: Praticdose, Cima and Adhesia Équipements. PRATICIMA’s Headquarter is located in Reyrieux, 25 km far from Lyon. Our company consists of 120 employees and is divided in two production sites: Reyrieux and Avranches. 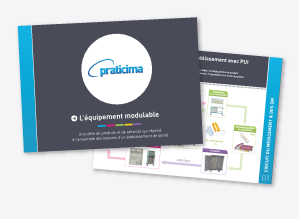 Thanks to its size and its turnover, PRATICIMA is now the 1st French company on the equipment and care furnitures market. We conceive and manufacture the equipments for care establishments. We propose you a wide range of high quality products. We are recognized for our know-how and we innovate and develop, all the time, new equipments. Each product lines is designed by our design office in collaboration with care professionals. The selected technical choices for our products are initiated by our Quality commitment in the ISO 9001. All over the world, a sales team will assesses your needs. Thanks to an internal production service and a reactive team, Praticima is every day trying to offer you better services in Reactivity, Flexibility and in Respecting the deadlines.